So, as most of you know, motivation to exercise is not really an issue for me. I truly enjoy working out (most of the time). However, nutrition is where I struggle. I know what to eat (usually), it's making the right choice is where I stumble. That being said, since I started my new job (Check out my post at Today's Words Of Glass if you have a moment. Yep, it's my other blog. I've decided it was time to re-vive it along with managing this one) But back to what I was saying... since I've started my new job, I've been packing everyone's lunch. has greatly improved. Not that I keep a lot of junk food in the house, but I will find myself actually driving to a local market to get a candy bar etc. Well, I can't do that while I'm at work. And packing my food/snacks is allowing me to have healthier options. 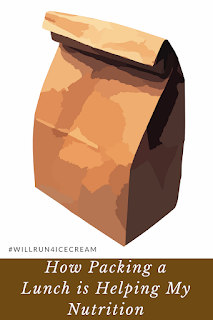 On Sunday, I gather all of my non-perishable items together (raisins, nuts, and occasionally pretzels) and put them in an individual paper sack. The night before I usually gather all of my cold items or prep my fruits etc that I might have that day and place them together in the frig. So when I make my lunch, all I have to do is basically grab and go. I put it all in my lunch box and that's it. Yeah, it requires some prep work, but I've found that doing the majority of prep on one day really does save time during the week. Salads can be made ahead of time etc. And I actually have separate paper bags for each of us. Hubby has his bag, Lil Man has his, and I have mine. And each day that we pack, I empty the contents into their lunch box and then re-use the paper sack for the following week when I do prep work. It works for us. Mornings can be stressful, especially if we are running late, so I need packing lunches to be a simple process. I have to say that I haven't missed my junk food either during the week. I've rarely craved it. Maybe it's because I'm so busy? I'm not sure. But this past week has been great. Now if I could just get a handle on the emotional eating on the weekends... sigh... it's a work in progress friends... it truly is... and this weekend has been the worst in a long time with emotional eating. And my joints are screaming at me for the junk that I have eaten. But what's a girl to do? I've just gotta pick myself up, dust myself off, do a little self evaluation and move on. I would say that tomorrow is a new day. But why wait until tomorrow? Why not make this very moment a fresh start? It's what I'm gonna do.... how about you?